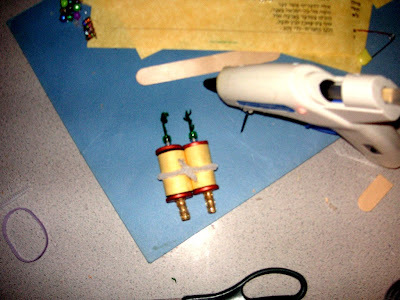 These are instructions for making a toy sefer Torah. Last year, when I made the original toy Torah for our toy shul (synagogue), I used strips of Tyvek, painted with beige acrylic paint, glued together, and handwritten with a paint marker. 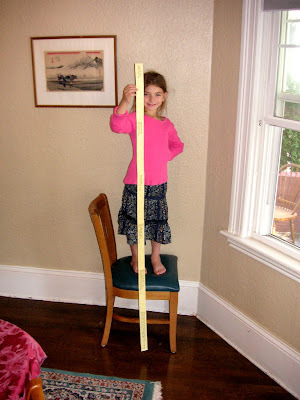 The resulting scroll was about 15' (5m) long. I wrote on it the first sentence of each book, and the last three sentences of the Torah. 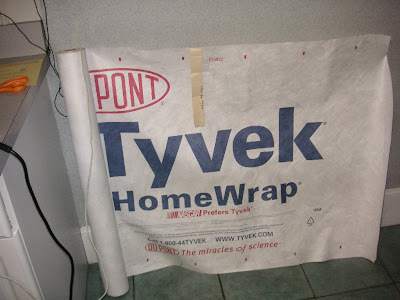 The Tyvek was wonderful, It was strong and held the paint well. 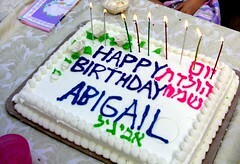 The handwritten words looked very nice, but they took forever to write. 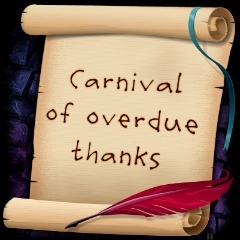 I had fun, but it was too tedious to repeat this year. This time around, I've taken shortcuts. 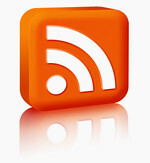 Thinking of the you, the people reading this blog, I wanted to make this project easy to reproduce. 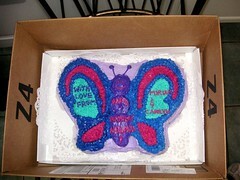 Perhaps it will be used in a classroom or for a party. 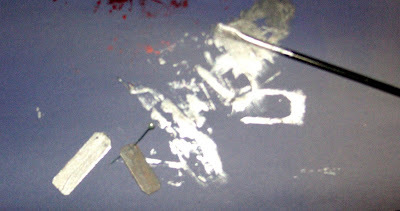 So, instead of handwriting on painted Tyvek, let's use two pieces of paper printed from a .pdf file! 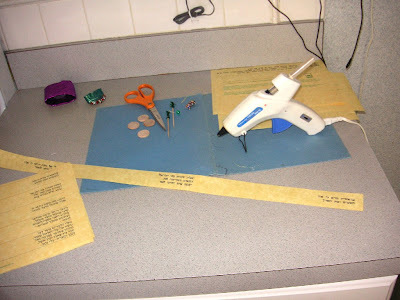 If I were doing this for a birthday party or classroom full of children, I'd drill all the holes before the class, and cut the paper strips with a paper cutter or guillotine, or let the kids cut the strips. 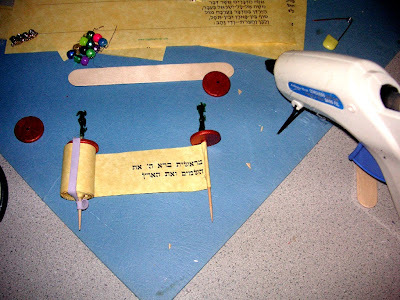 Toy Torah Scroll with nikkud This file uses an easy-to-read font with vowels. Toy Torah Scroll with STAM font This file uses a more authentic font without vowels, meant to look more like font used in the Torah. 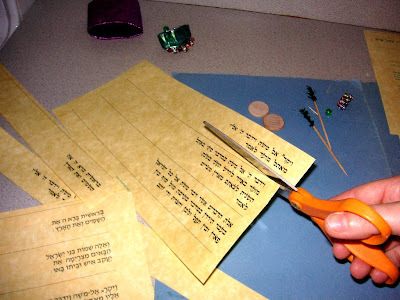 These files can be printed, cut, and glued together to make a toy Torah scroll 'parchment'. 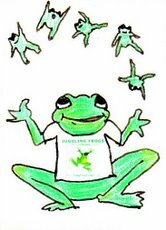 They can also be used as a guide for a child (or a classroom of children) to copy the sentences onto another page (for pedagogical purposes). The strips are 1.5" wide. Printing on buff-colored paper (or parchment-style) enhances the look of this project. Each scroll uses 2 sheets of paper. To make the "eitzim" (lit. : trees), the handles that hold the scroll, I use frilly ('club' or 'cocktail') toothpicks. Wooden skewers trimmed with a scissors, or regular toothpicks would also work. We have these on hand, and I like how the fancy frilly tops look. Ideally, use wooden discs for the (not sure what they're called) Torah's discs. 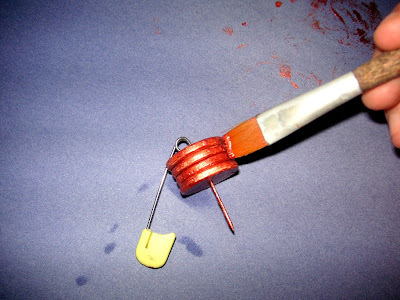 If you have a strong drill, could use painted pennies. 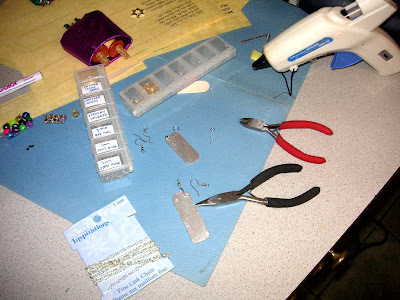 Could use a metal washer, spaced with beads, or doubled circles cut from foam sheets. The wooden discs are available at craft stores in bulk. We use them for many crafts, so there are always a few on hand. Drill a hole in the center of each disc. The diameter of the hole should be the smallest that accommodates width of the toothpick. Paint the disks. 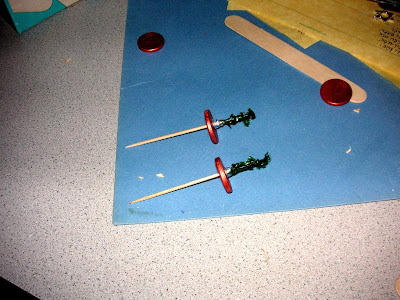 To paint the edges, line the painted discs on a safety pin or spare toothpick. This will help paint the edges quickly and completely, and also make sure the hole isn't filled with paint. It also allows for easy transport of the wet discs. If you're doing a classroom's worth of these, this keeps each child's project separate, and minimizes drying space. 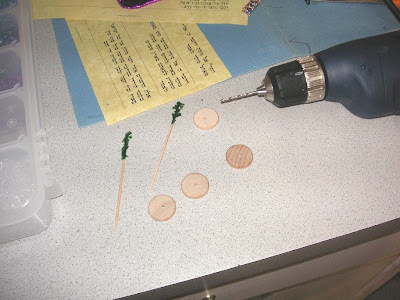 When the discs dry, place one on each of the toothpicks with a couple of beads, and glue in place. Glue the last three sentences to the toothpick that will become the LEFTside, wrapping the paper tightly around the toothpick. When the glue dries, wrap the scroll around itself on the toothpick, with the text facing the inside of the scroll. Wrap it all the way to the end middle of the first page and secure the scroll with a rubber band or pipe cleaner ('chenille stem'). Attach the scroll to the RIGHT toothpick, wrapping tightly. When the glue dries, wrap the right hand side. Glue the remaining pair of discs on the bottom of the toothpicks, and attach some beads to cover the remaining length of the toothpicks. These are the handles of the Torah. 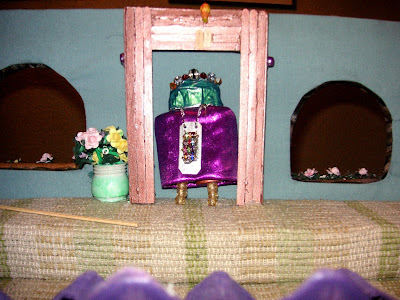 To make a Torah wimple (band that is tied around the scrolls), use a pipe cleaner. This will allow the children to 'tie' and 'untie'the wimple easily. 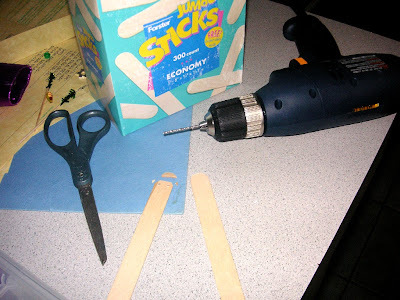 Snip the rounded edge from a craft/Popsicle stick with scissors, and drill two holes (for holding the chain) in along the top edge. I still had last year's jewel array, which was made from rondolle crystals from my bead stash. While the effect is very nice, it would be cost-prohibitive to do this with a large group of children. So, for the purposes of this demonstration, I made another version using plastic pony beads. In lieu of craft wire, I used some of my cache of obsessively hoarded recycled twist-ties. The paper can be peeled from the twist-tie to provide perfectly-sized pre-cut (usually 22 gauge) wire. The breastplate should be made with twelve (preferably different colored) beads, in four rows of three beads. For each row, thread the wire back through both end beads to secure, pulling the wire tightly to make them rest together. The wire isn't strictly necessary. 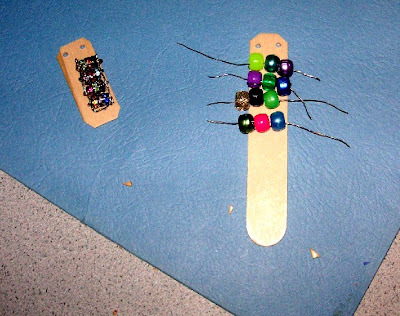 You could just glue the beads on the bit of Popsicle stick. 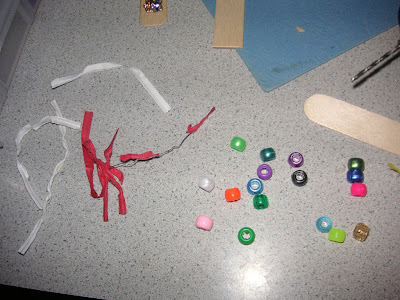 However, this makes it harder to lose a bead, easier to glue in place, and less likely to fall apart once the toy is complete. 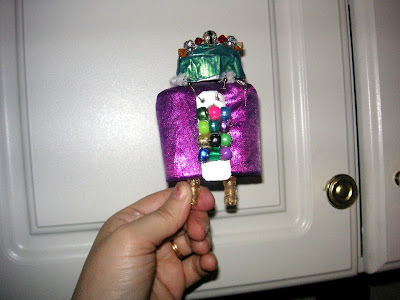 The goal of this activity is to make a toy that can withstand constant play. 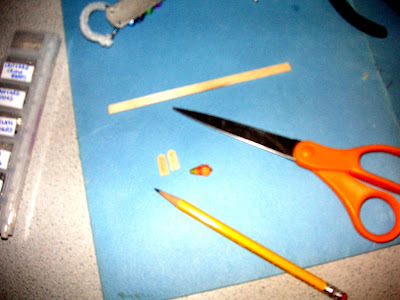 Twist the ends of the wires together, forming a rectangular array of beads, with 4 rows of 3. 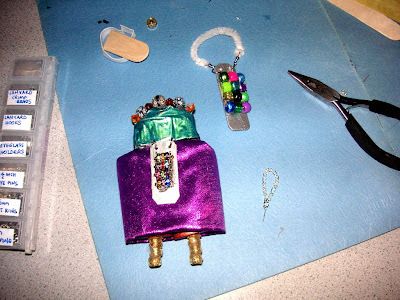 Tuck the wires behind the beads, and trim the ends. 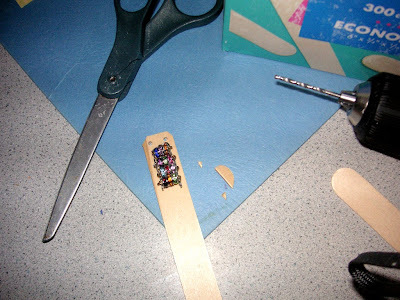 Cut the Popsicle stick to a size that will accomodate the length of the bead array, allowing a bit of room for the chain at the top. Paint the Popsicle stick bits. Silver paint is most appropriate. Using whatever findings available, attach a chain through the two holes. I like to use 7mm split rings, as they are most permanent. But split rings can be frustrating to work with. I wouldn't recommend them for large groups. Jump rings are easier to work with, but they make a less durable connection. Alternatively, if you have a some earring wires (either purchased or leftover at the bottom of the jewelry box), they make great connectors. Twist them with a pliers to secure and trim the excess. This should be done by an adult. In these examples, I used the split rings for the crystal breastplate, and spare earring wires for the pony bead breastplate. Attach a craft chain (or a bit of a broken necklace chain from the bottom of your jewelry box) to the breastplate. 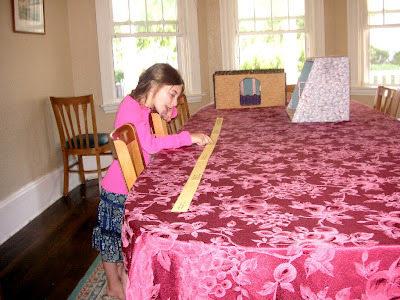 Measure it to see where it falls on the toy Torah before cutting. 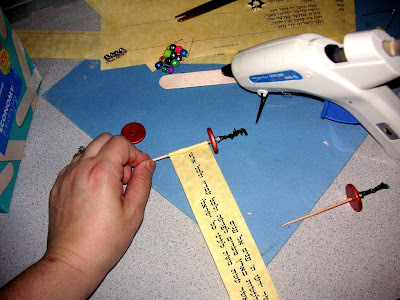 The 'yad' (Torah pointer) here is made from a snippet of craft chain, attached to a 0.5" eye pin with a jump ring. A bit of a twisted paper clip would work well as a substitute for the eye pin. 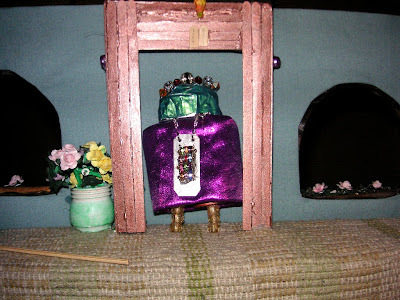 The Torah cover (pink) and the keter (crown, blue/green) were made by forming a shape with duct tape and either covering with fabric scraps (cover) or painting the duct tape directly (crown). 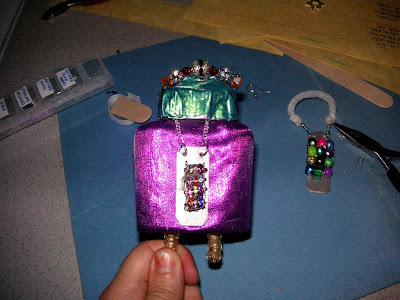 A denuded twist tie was strung with fancy beads and stuck in the crown's top. 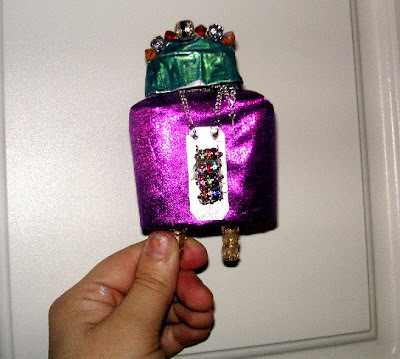 This is the toy Torah, with the crystal breastplate. 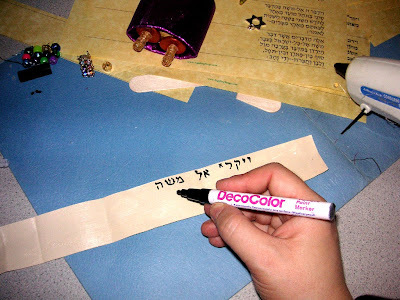 To make 'luchot' (tablets) for decorating the aron hakodesh ('holy closet' where the Torah is kept), snip the rounded ends from a wooden coffee stirrer, and write the letters with a pencil. I find it amazing that you put so much effort into your projects. 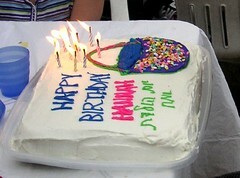 They're so creative! Good for you! Thanks, Chana! We have a lot of fun with them. They often take longer to explain than to implement. Thank you, and welcome back from your break! I made sure there weren't any shaimot in the toys. I typed in the text in the files myself, and used hei instead of Hashem's name everywhere. I hate when the kids come home from school with shaimot in their projects or homework. I had been browsing the net for a very creative project. I saw this and I said, this is very well explained and looks fun to do! I will be doing this as soon as I get a hand of the materials!